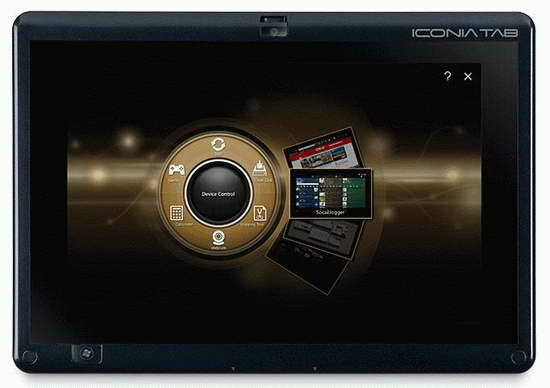 Das Iconia Tab W muss sich den Vergleich mit einem Netbook gefallen lassen. Dafür ist es aber zu teuer und zu wenig ausdauernd. Gegenüber anderen Tablets ist es auch zu schwer. Pluspunkt: sehr gute Konnektivität. Wird aus dem iPad-Boom ein Tasblet-Boom?Wir haben vier neue Tablet-PCs mit gänzlich unterschiedlichen Stärken unter die Lupe genommen. Das einzige Windows-Tablet im Vergleich ist dank andockbarer Tastatur auch ein Netbook. Schon 2003 baute HP einen Tablet-Notebook-Hybriden mit Windows, den TC1000. Acer bringt das Konzept mit seinem ausdauernden W500 einen Schritt nach vorn, praxistauglich ist er im Tablet-Modus aber nicht. Neben iOS, Android und einigen neueren Betriebssystemen steht auch Windows 7 auf Tablets seinen Mann, wie das Iconica W500 mit 12-Zoll-Display (1024 x 800 Pixel) und AMD-C-50-Prozessor beweist. Die mehrmalige Verwendung des Begriffs "Iconica" dürfte ein Fehler sein. The Acer Iconia Tab W500 is baffling. 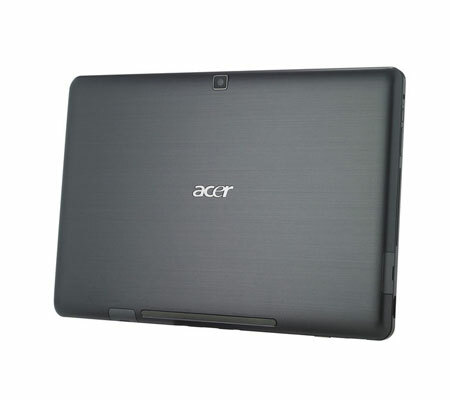 It tries to bridge the gap between full notebooks – which Acer makes well – and tablets, and fails at both. Overall, the Acer Iconia Tab W500 works better as netbook than a Tablet. 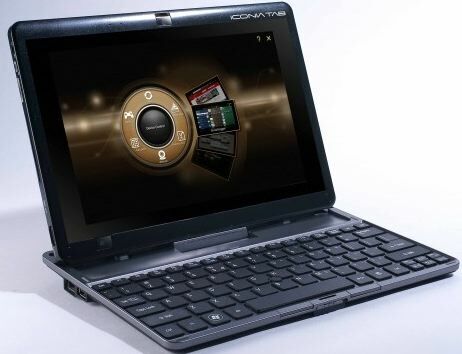 If you are looking for a ­lightweight netbook primarily for surfing the Web, the W500 fits the bill nicely. 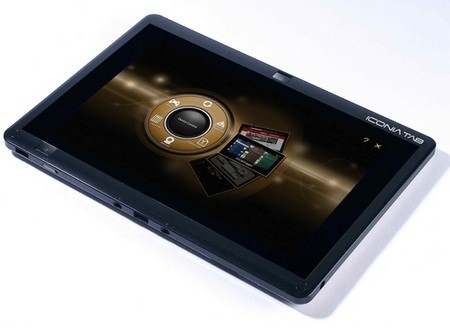 The Acer Iconia W500 is a device that does the tablet cause no good. The keyboard dock is clumsily implemented but without it, using Windows 7 becomes a chore. After a few more passes from Acer's design bods it could have been closer to a winner, but as is it's too bulky to beat rival Android tablets and not convenient enough to worry ultra-portable laptops. The design flaws together with a total price of £519 to get the dock could put off some users, however the fact that the tablet runs Windows could make it attractive to businesses. We could put up with the W500's numerous shortcomings if the battery life was long, but even here the W500 is disappointing. In our light usage web browsing test it lasted just under seven hours. This is long compared to 15in laptops, but most netbooks and some ultra-portable laptops can last as long as ten hours. When playing H.264 video, the battery ran for just under five hours. This might seem impressive at first glance, but it pales in comparison to the iPad 2 which lasted 17 hours in the same test. The bottom line is that you'd need to keep the charger close by when using the W500 just so it doesn't ran out of battery power when you need it most. A poorly executed and expensive attempt to create a hybrid of two popular form factors. 57.75%: Eine so schlechte Bewertung ist selten. Es gibt nur wenige Notebooks, die schlechter beurteilt wurden. Auch wenn Verbalbeurteilungen in diesem Bereich meist "genügend" oder "ausreichend" lauten, so sind dies meist Euphemismen.